Happy Thanksgiving from CLOUSER and Heidi Bird! We hope that you and your family, wherever they might be have a safe and wonderful holiday. Please take the time to reflect on the things for which you are thankful. We are thankful for our families and often reflect on the times when we were younger. I know for the Clouser family, we had great times on the farm in central Indiana. I’m not sure if I have shared this, but there are 14 children in our family. Some have passed, but will never be forgotten. I am thankful for all the great times we had when gathered together. I can still smell the aroma in the house of the turkey baking, and of the pies and breads that my mother and my sisters were preparing. Our times – weather permitted- included either basketball or some football in the backyard. (With 14 kids around we could field a baseball game or a little 3 on 3). And for the Heidi Bird family, we also had large Thanksgivings with all of my mom’s siblings and more than 10 cousins running around as we hosted this holiday at our house. Some years we dressed up like pilgrims and always set a big table complete with turkey salt and pepper shakers. But after the 1pm meal, we went outside to play football games with my uncles and cousins or go on walks before dessert. No matter how many people were present, my mom is famous for making us go around the whole room and say what we are thankful for. This year, I’m thankful that my mom and dad because no matter how much ridicule or how long it took, we always did that. I’m thankful for all of my now larger family and the community of people we surround ourselves with. 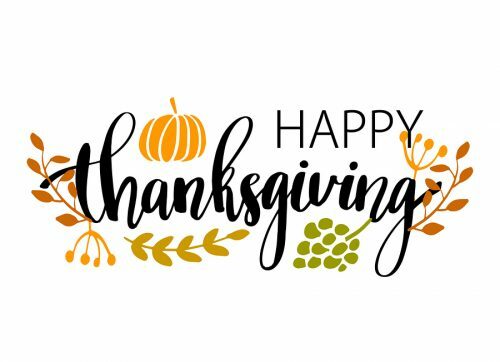 What are you thankful for this Thanksgiving Day 2018? Take some time away from the hustle and bustle life we live and work in. You might just come across a memory or a friend, coworker, or the guy or gal in the grocery store for whom to give a thanks. Great memories, for sure, Mr. Clouser. We were both blessed abundantly, weren’t we?! Thanksgiving Weekend is my favorite. I hope yours has been great. Keep up the fine posts. I appreciate and learn from them.